The Pope is at it again. Once again he insults us for our faithfulness to Catholic truth and tradition. The youth love the Traditional Latin Mass because they are tired of the worthless, Protestant drivel that is spoon fed to the masses at the Novus Ordo. Rigidity in the Faith is a sure sign of Catholicism. Christ said that he would spit the lukewarm out of his mouth. THE Mass is not an extraordinary occurrence. It’s the reason for the world’s existence. It’s the re-presentation of the greatest act of history, Christ’s death on the cross to redeem us. I despise this scornful attitude towards Catholics. What they do to us they do to the Catholics and Saints of the past 2,000 years, before the Church was corrupted by those trying to change Her for their wicked designs. We want Truth. Goodness. Beauty. Faithfulness. Authenticity. We’re working out our salvation in fear and trembling. As I read these unfortunate words from the Holy Father, I cannot help but think about the experiences I have had as a young person with this mass. Now, I have not attended a New mass in fulfilling the Sundayobligation since 1997, but having a large extended family, I have oftentimes passively attended weddings or funerals for which the New mass is offered. Just this past week, I passively attended a New mass for the funeral of a relative. Despite the conservative surroundings that can often be present(the young priest, for one, preached an almost unusually conservative sermon compared to many we hear today), the entire atmosphere was strikingly unfulfilling. The wake was quite dreadful, being essentially a “meet and greet” for almost everyone involved. The whole church echoed with excitement as a football stadium would, and several people came to me to exchange jubilant greetings and even start a conversation. Absolutely no one was on their knees with the body of the deceased lying a few feet away. As for the service itself, the priest was again fine and even almost conservative, but everything else was severely lacking in holiness. The “hymns” were a catastrophe, with the equivalent of a young “country star” singing “Bible” music off-tune. Every single person received what is putatively Our Lord in the hand and many particularly enjoyed the “Sign of Peace” and raising their arms up during the prayers. I have been to New masses both more conservative and more “open” than this, but the reaction from myself and my siblings is largely the same. This mass does not lift up our minds and hearts as the Mass should, but leaves us strangely bored and unfulfilled. 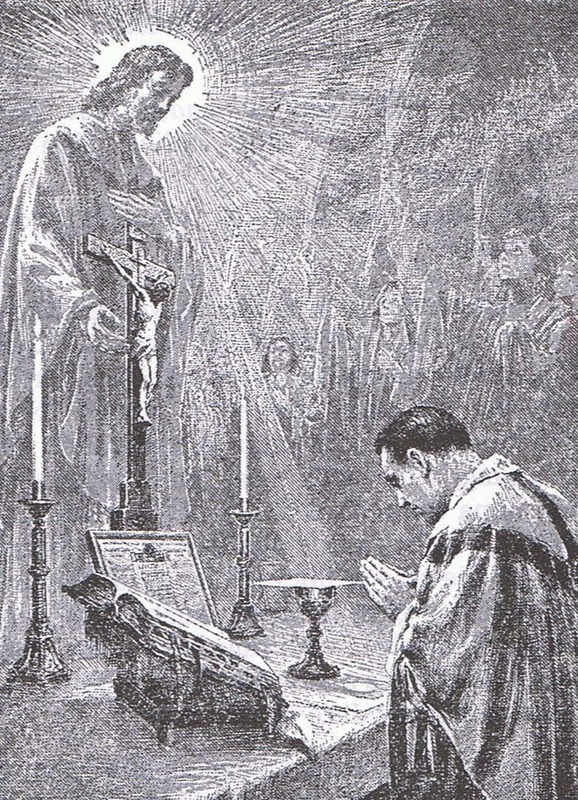 Even if Our Lord may be present in correctly said New masses, the entire service is simply bland and protestantized. There is no life to it. It is easy to see how young people can so often leave or reject something so bland, ambiguous, lifeless. Young people, and really all people want truth, beauty, life! And this is the norm for Pope Francis. Nonetheless, we must pray for the Pope. 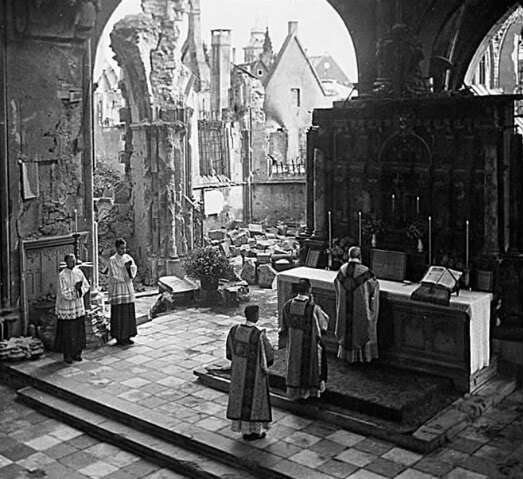 It is curious to hear him utter such words about the Traditional Mass, and then oftentimes show seemingly honest goodwill towards many affiliated with the fight for Tradition(Fr. Gruner, conservative and traditional journalists and writers, the Society of St. Pius X, etc.). Does this Pope have a special “sympathetic” side when it comes to reaching out to those in the “peripheries”, even to the point where it contradicts his own principles? God may only know. The Modernist mind is a very confused one indeed. Hopefully the recent appeals from the more orthodox bishops and cardinals will help the Pope see the errors of his statements, although he has not responded as of yet. Pray much for the Holy Father! This entry was posted in Church crisis, Modernism and tagged Crisis in the Church on November 16, 2016 by damselofthefaith. Actually, Excellency, your altars can be called false in every sense of the word, since you advocate the desacrilization of the Holy Sacrifice of the Mass and the Blessed Sacrament by relegating it to a simple meal, void of any semblance of the Sacrifice of the Cross. 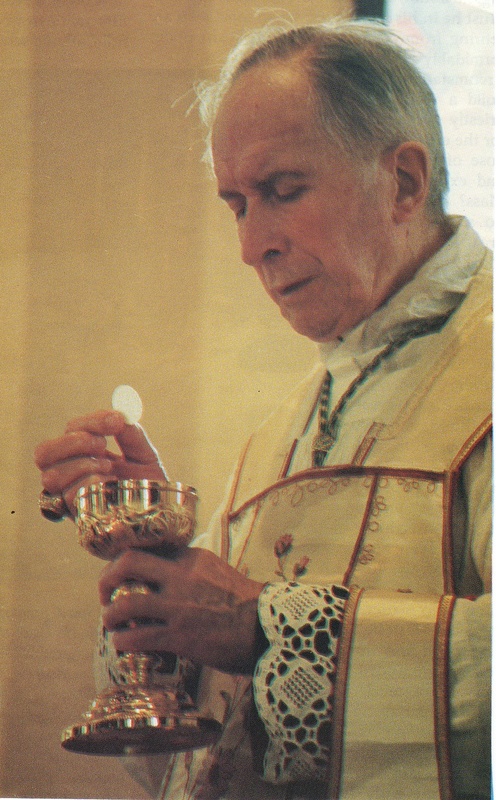 By facing the people you turn your back on God, but you have actually done worse, for the Modernists have thrown the Blessed Sacrament from the altar and cast him into a closet. What does this tell us about you? You do not hold the Catholic Faith. 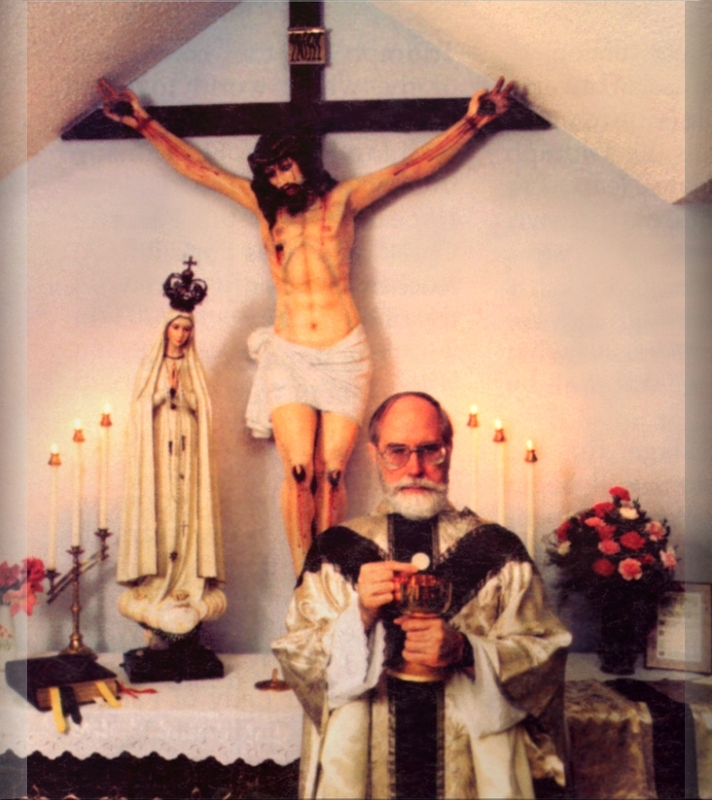 With the likes of these Modernists, it is a great miracle that the Traditional Latin Mass has survived. 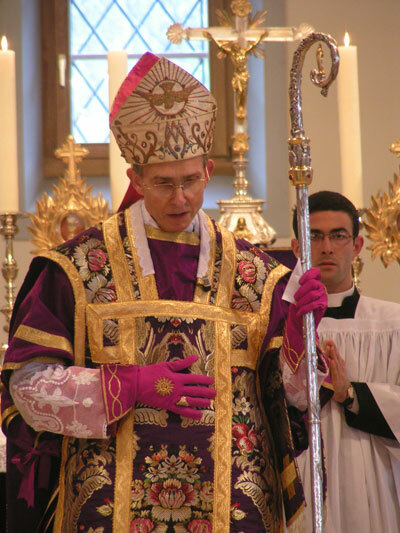 Due credit to Archbishop Lefebvre and our great SSPX, for preserving the Faith when it was under most attack. 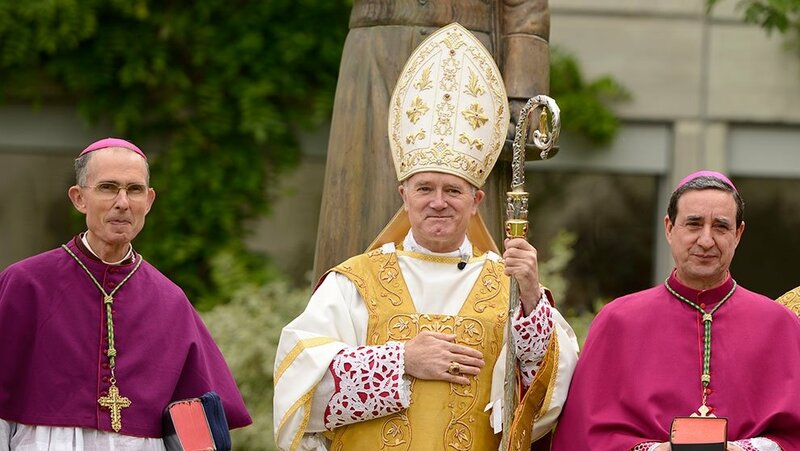 May God have mercy on this disgraceful Bishop and move him to repentance for his hatred of the Mass of All Time and the True Catholic Faith of saintly generations. Without these Altars, the world would cease to exist. This entry was posted in Church crisis, Modernism, Novus Ordo and tagged Crisis in the Church, Modernism on November 10, 2016 by damselofthefaith. The Pope blasphemes Catholic Marriage. Accompany them to what? When the Church was in a healthy state and Popes taught the Catholic Faith, this would have meant to “accompany” them back to the state of Sanctifying grace, without which there is no life in the soul. How do you “wait” on cohabitators to achieve a supposedly Catholic Marriage without admonishing them and warning them that they are living contrary to the laws of God and are bringing damnation to their souls, telling them that to amend this they must leave their sinful situation? To Pope Francis, cohabitation is the new marriage which ultimately means Marriage is meaningless and basically non-existent. Is cohabitation to be raised to the permanence and holiness of Marriage? Are the pleasures of sin to be raised to the dignity of a Sacrament and upheld as a means to the end of fidelity and holiness? Is Marriage too hard to live by now, with its duties, obligations and responsibilities? What happened to picking up our crosses and following Christ? Why do we have to pander to the pleasures of the people? The Pope, like those disciples of Christ who walked away from Him after He said that we must eat His Body, is ultimately saying concerning marriage, “this saying is hard. Who can accept it?” (John 6: 60). Instead of accepting Christ and His teachings, it seems we have to be accepting of the modern culture that is entrenched in sin, all in the name of a false mercy and pastoral charity. Fidelity does not exist in sin. Cohabitation is unlawful and a blasphemy to the unity and indissolubility of lawful marriage based on fidelity to Christ and His Church. If there is no fidelity to God by keeping His Commandments, there can be no fidelity to each other. A lawful Marriage is a lifelong covenant and vow made before God by a man and woman. Anything else is a mortal sin and to see the Pope approving of mortal sin (of course this isn’t the first time) is a shameful disgrace. Q. 1005. What is the Sacrament of Matrimony? A. The Sacrament of Matrimony is the Sacrament which unites a Christian man and woman in lawful marriage. Q. 1006. When are persons lawfully married? A. Persons are lawfully married when they comply with all the laws of God and of the Church relating to marriage. To marry unlawfully is a mortal sin, and it deprives the souls of the grace of the Sacrament. Q. 1007. When was marriage first instituted? A. Marriage was first instituted in the Garden of Eden, when God created Adam and Eve and made them husband and wife, but it was not then a Sacrament, for their union did not confer any special grace. Q. 1008. 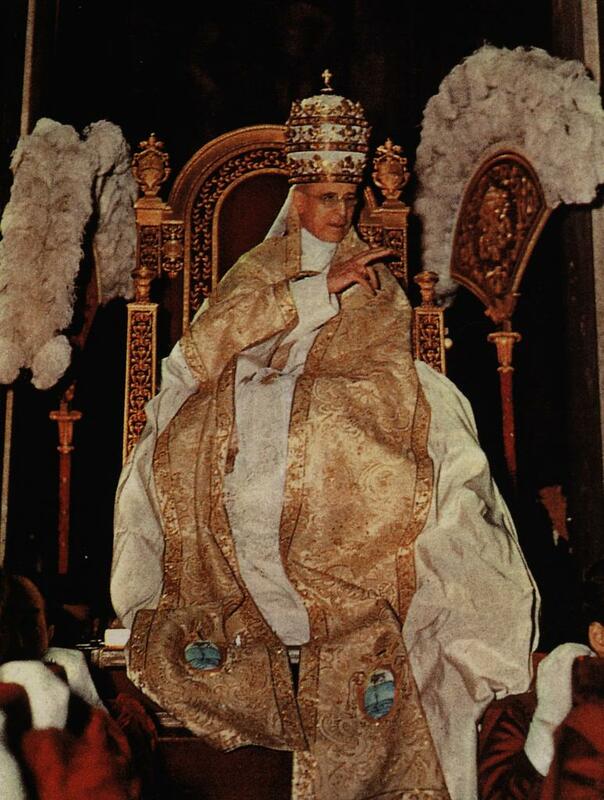 When was the contract of marriage raised to the dignity of a Sacrament? A. The exact time at which the contract of marriages was raised to the dignity of a Sacrament is not known, but the fact that it was thus raised is certain from passages in the New Testament and from the constant teaching of the Church ever since the time of the apostles. Our Lord did not merely add grace to the contract, but He made the very contract a Sacrament, so that Christians cannot make this contract without receiving the Sacrament. Q. 1009. What is the outward sign in the Sacrament of Matrimony, and in what does the whole essence of the marriage contract consist? A. The outward sign in the Sacrament of matrimony is the mutual consent of the persons, expressed by words or signs in accordance with the laws of the Church. The whole essence of the marriage contract consists in the surrender by the persons of their bodies to each other and in declaring by word or sign that they make this surrender and take each other for husband and wife now and for life. Q. 1010. 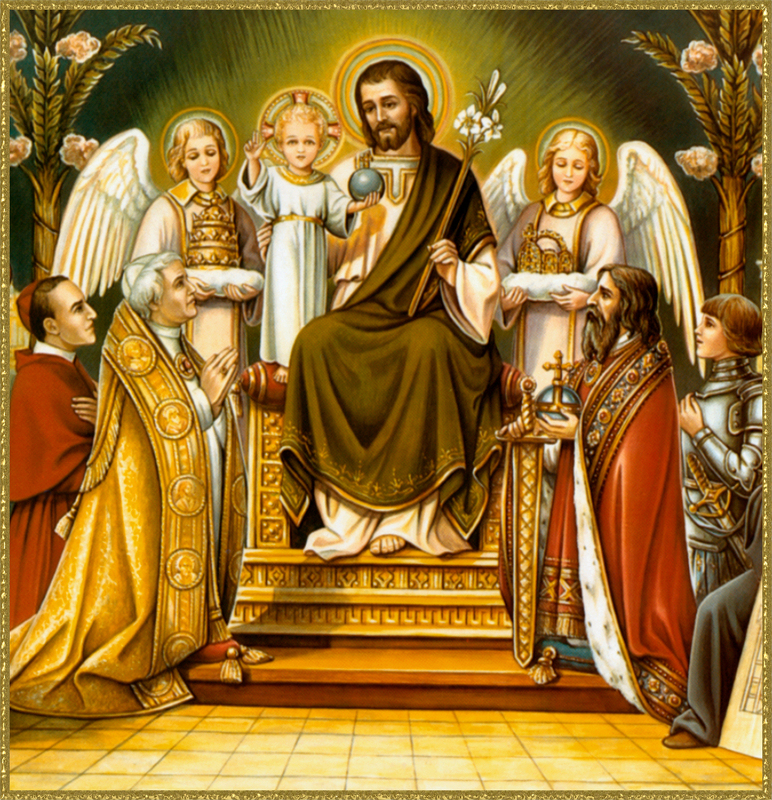 What are the chief ends of the Sacrament of Matrimony? To prevent sins against the holy virtue of purity by faithfully obeying the laws of the marriage state. Q. 1011. Can a Christian man and woman be united in lawful marriage in any other way than by the Sacrament of Matrimony? A. A Christian man and woman cannot be united in lawful marriage in any other way than by the Sacrament of Matrimony, because Christ raised marriage to the dignity of a sacrament. 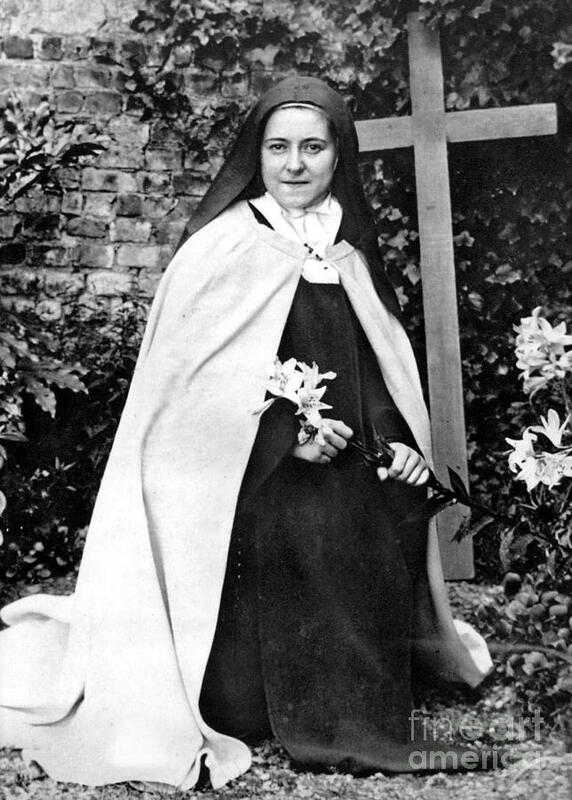 “Marriage has God for its Author, and was from the very beginning a kind of foreshadowing of the Incarnation of His Son; and therefore there abides in it a something holy and religious; not extraneous, but innate; not derived from men, but implanted by nature… As, then, marriage is holy by its own power, in its own nature, and of itself, it ought not to be regulated and administered by the will of civil rulers, but by the divine authority of the Church, which alone in sacred matters professes the office of teaching.” ~Pope Leo XIII, “Arcanum”, 1880 A.D.
It’s blasphemy to put the profane on par with the holy. 293. 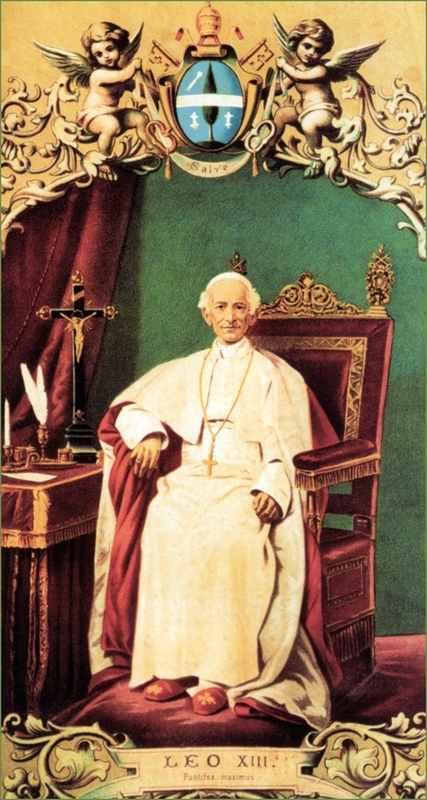 The Fathers also considered the specific situation of a merely civil marriage or, with due distinction, even simple cohabitation, noting that “when such unions attain a particular stability, legally recognized, are characterized by deep affection and responsibility for their offspring, and demonstrate an ability to overcome trials, they can provide occasions for pastoral care with a view to the eventual celebration of the sacrament of marriage”. On the other hand, it is a source of concern that many young people today distrust marriage and live together, putting off indefinitely the commitment of marriage, while yet others break a commitment already made and immediately assume a new one. “As members of the Church, they too need pastoral care that is merciful and helpful”. For the Church’s pastors are not only responsible for promoting Christian marriage, but also the “pastoral discernment of the situations of a great many who no longer live this reality. Entering into pastoral dialogue with these persons is needed to distinguish elements in their lives that can lead to a greater openness to the Gospel of marriage in its fullness”. In this pastoral discernment, there is a need “to identify elements that can foster evangelization and human and spiritual growth”. 294. 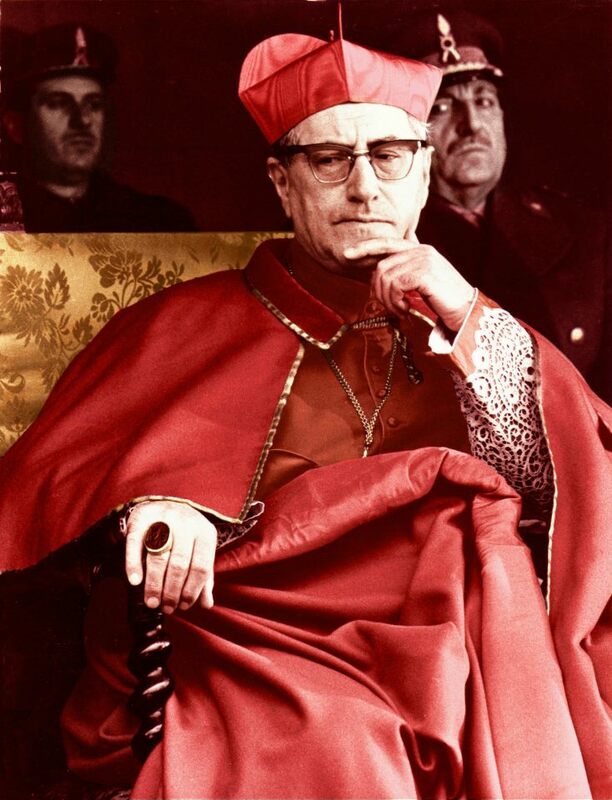 “The choice of a civil marriage or, in many cases, of simple cohabitation, is often not motivated by prejudice or resistance to a sacramental union, but by cultural or contingent situations”. In such cases, respect also can be shown for those signs of love which in some way reflect God’s own love. We know that there is “a continual increase in the number of those who, after having lived together for a long period, request the celebration of marriage in Church. Simply to live together is often a choice based on a general attitude opposed to anything institutional or definitive; it can also be done while awaiting more security in life (a steady job and steady income). In some countries, de facto unions are very numerous, not only because of a rejection of values concerning the family and matrimony, but primarily because celebrating a marriage is considered too expensive in the social circumstances. As a result, material poverty drives people into de facto unions”. Whatever the case, “all these situations require a constructive response seeking to transform them into opportunities that can lead to the full reality of marriage and family in conformity with the Gospel. These couples need to be welcomed and guided patiently and discreetly”. What is happening here is the promotion of Situation Ethics. Although Pope Francis might have insisted to some, e.g., the SSPX, that he does not intend to change doctrine, it would seem that the doctrine could be “flexible” in “pastoral” application. Situation Ethics is the rejection of the universal, binding, immutable norms of morality. There is no such thing as a moral act that is intrinsically evil, there is no rule that admits no exceptions. According to this false approach, the morality of an act ultimately depends not on objective truth, but on the individual’s given situation. “…In keeping with the natural law, man has a right to exercise his sexuality only within lawful marriage, while respecting the limits set by morality. This is why homosexuality contradicts natural and divine law. Unions entered into apart from marriage (cohabitation, adulterous, or even homosexual unions) are a disorder contrary to the requirements of the natural divine law and are therefore a sin; it is impossible to acknowledge therein any moral good whatsoever, even diminished. As the Catholic liturgy and doctrine were significantly ignored or even rejected to a point by Fathers of the “pastoral” Second Vatican Council, Pope Francis, as a Son of the Council, is taking the next step in putting even basic morality under this “pastoral” treatment. 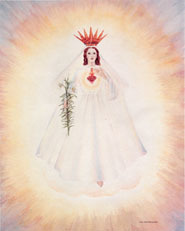 Let us pray to the Sacred and Immaculate Hearts for the eventual triumph that is promised by Our Blessed Mother at Fatima! This entry was posted in Apostasy, Catholic, Church crisis, Holy Matrimony, Modernism, Synod on the Family and tagged apostasy, Crisis in the Church, Holy Matrimony, Modernism on June 20, 2016 by damselofthefaith. How much has changed in 200 years! To hear these words spoken again by a holy Pope, with much more zeal and concern for the salvation of souls in this 21st century, a century full of heresy, apostasy and Modernism that has overrun the Catholic Church, is the hope of every Catholic that truly loves the Church. “If ever those in charge of the Lord’s vineyard should be concerned about the salvation of souls, they must be so in this age especially. For many ideas aimed at weakening religion arise almost daily. When men are enticed by novelty and led on by an eagerness for alien knowledge, they come together more eagerly for this very purpose and more willingly embrace it. Wherefore, We lament that the destruction of souls is propagated more widely each day. Accordingly you must work all the harder and exercise diligence and authority to repel this audacity and insanity which stalks even divine and most holy matters. Be confident that you will accomplish this by simplicity of sound doctrine and by the word of God which penetrates more than any two-edged sword. You will easily be able to contain the attack of enemies and blunt their weapons when in all your sermons you preach and present Jesus Christ crucified. By His own laws and institutions He founded and reenforced this holy city which is His Church. To it he entrusted, as it were, the deposit of faith in Him to be preserved piously and without contamination. He wished it to be the bulwark of His teaching and truth against which the gates of hell would never prevail. This entry was posted in Apostasy, Church crisis, Encyclicals, Modernism, Prophecy, Quotes from the Saints and tagged apostasy, Crisis in the Church, Prophecy, Saint quotes on June 1, 2016 by damselofthefaith. “Also perverse is the shocking theory that it makes no difference to which religion one belongs, a theory which is greatly at variance even with reason. By means of this theory, those crafty men remove all distinction between virtue and vice, truth and error, honorable and vile action. 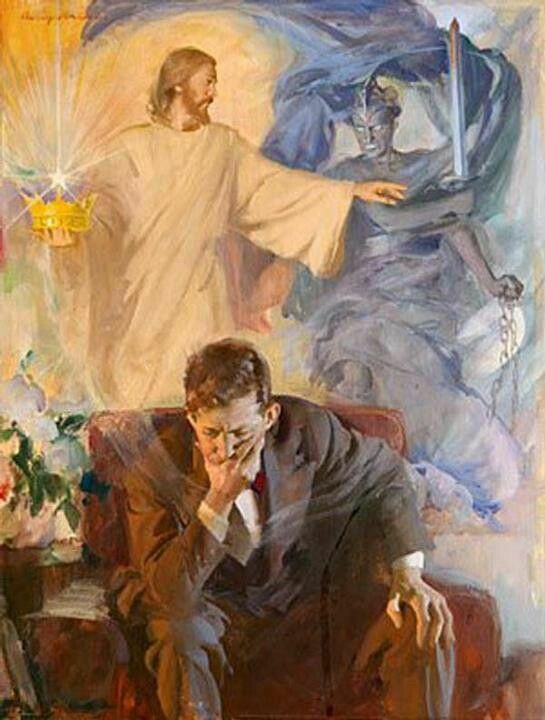 They pretend that men can gain eternal salvation by the practice of any religion, as if there could ever be any sharing between justice and iniquity, any collaboration between light and darkness, or any agreement between Christ and Belial.” ~Bl. Pope Pius IX, “Qui Pluribus”, 1846 A.D. But stranger still, alarming and saddening at the same time, are the audacity and frivolity of men who call themselves Catholics and dream of re-shaping society under such conditions, and of establishing on earth, over and beyond the pale of the Catholic Church, ‘the reign of love and justice’ with workers coming from everywhere, of all religions and of no religion, with or without beliefs, so long as they forego what might divide them – their religious and philosophical convictions; and so long as they share what unites them – a ‘generous idealism and moral forces, drawn from whence they can’. 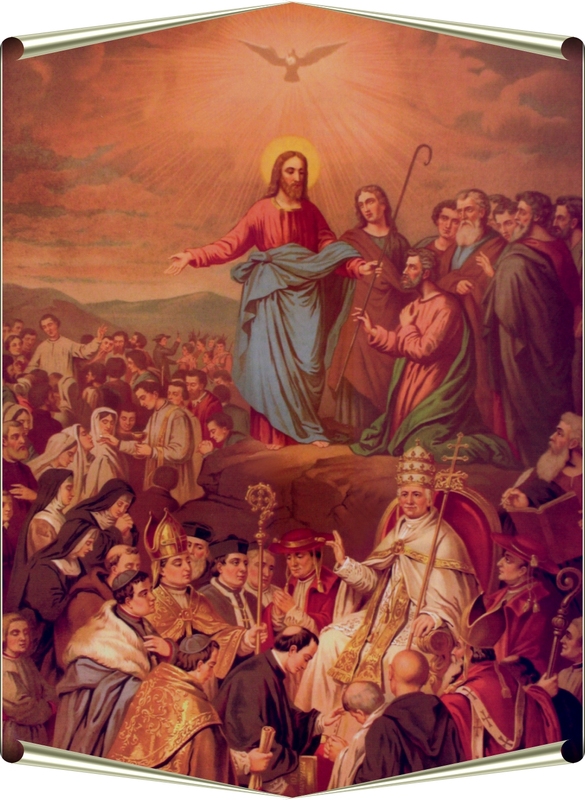 When we consider the forces, knowledge, and supernatural virtues which were necessary to establish the Christian City, and the sufferings of millions of martyrs, and the light given by the Fathers and Doctors of the Church, and the self-sacrifice of all the heroes of charity, and a powerful hierarchy ordained in heaven, and the streams of Divine Grace – the whole having been built up, bound together, and impregnated by the life and spirit of Jesus Christ, the Wisdom of God, the Word made Man – when we think, I say, of all this, it is frightening to behold new apostles eagerly attempting to do better by a common interchange of vague idealism and civic virtues. What are they going to produce? What is to come out of this collaboration? A mere verbal and chimerical construction in which we see, glowing in a jumble, and in seductive confusion, the words Liberty, Justice, Fraternity, Love, Equality, and human exultation, all resting upon an ill-understood human dignity. 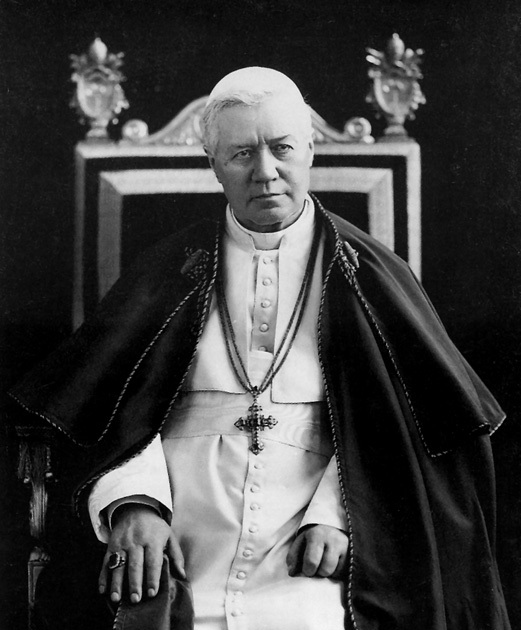 It will be a tumultuous agitation, sterile for the end proposed, but which will benefit the less Utopian exploiters of the people.” ~Pope St. Pius X, “Notre Charge Apostolique”, 1910 A.D. This entry was posted in Church crisis, Ecumenism, Modernism, Pope St. Pius X, Quotes from the Saints, Saint quotes, Uncategorized and tagged apostasy, Crisis in the Church, Modernism, Pope St. Pius X, Saint quotes on January 12, 2016 by damselofthefaith. 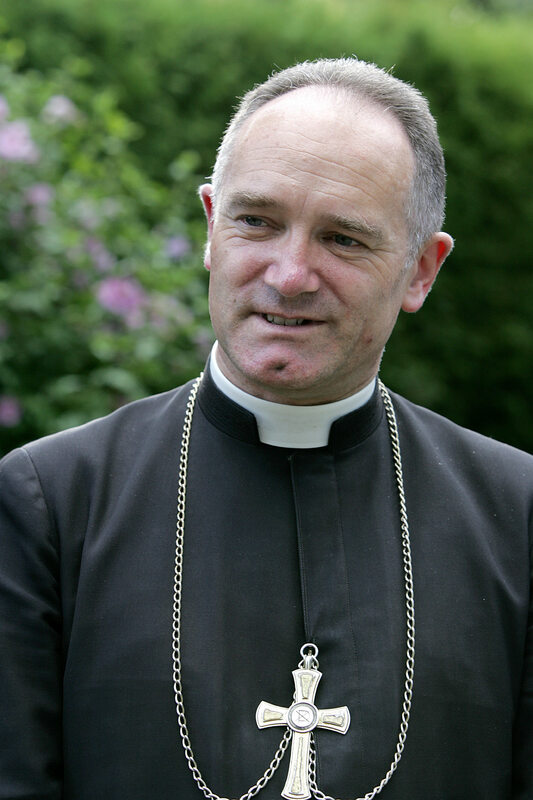 The following is Bishop Fellay’s Letter to Friends and Benefactors #85, concerning the Year of Mercy, the Synod on the Family, the Indissolubility of Marriage and the centenary of the apparitions of Our Lady of Fatima. Please read the Bishop’s beautiful words. During this time of grave apostasy, we must thank God for any Bishop who holds the Holy Catholic Faith and has the courage to speak the truth. and immediately afterward: “Whosoever shall put away his wife…committeth adultery” (Matt. 19:9). Therefore the Church has only one thing to do: tell the faithful of the divine law and enshrine it in ecclesiastical laws. In no case can the Church diverge in any way from it; that would be to fail in its mission, which is to hand on the revealed deposit of faith. In plain language, in the matter under consideration, the Church can only declare that there was no marriage to begin with, but in no case can it annul or dissolve a marriage that is valid in itself. It is true that, in the current climate, an appeal to mercy too easily neglects the indispensable act of conversion, which requires contrition for one’s sins and a horror of sin as an offense against God. Thus I deplored in the lastLetter to Friends and Benefactors (#84) the Honduran Cardinal Maradiaga’s complacent support of a new spirituality whose notion of mercy does not require repentance. 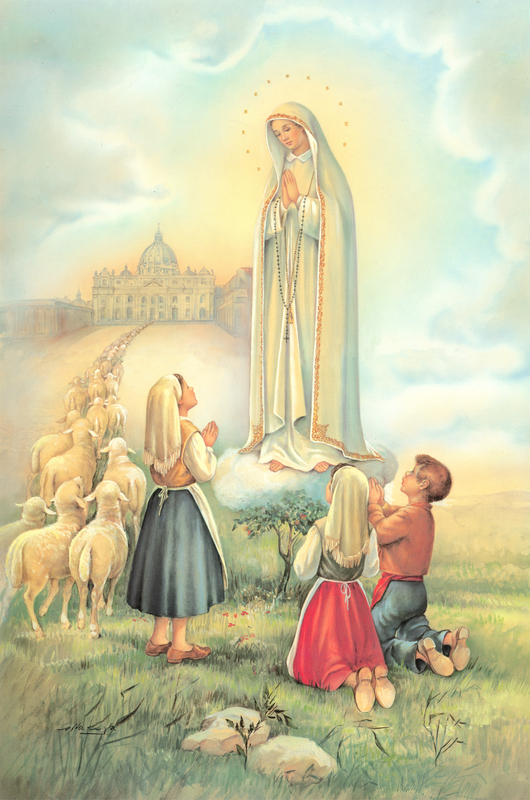 The Society of St. Pius X will organize an international pilgrimage to Fatima from August 21st to 23rd, 2017. But already we can and even must prepare ourselves, especially when Catholic morality is seriously being challenged. This entry was posted in Apostasy, Catholic, Church crisis, Modernism, SSPX, Uncategorized and tagged apostasy, Catholic, Crisis in the Church, SSPX on December 1, 2015 by damselofthefaith. Why is there a crisis in the Church? How will it be resolved? Ultimately, the root of this crisis in the Church is the deadly sin of pride, the first sin of the human race and of Satan. “We would rather serve man and not God. We do not want the hard religion, the religion of penance and sacrifice which is the ladder to Heaven. We do not want to be like little children and allow ourselves to be fed and taught. 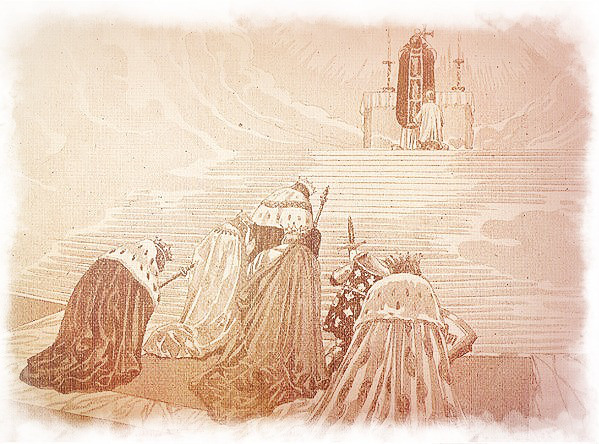 We want to be comfortable and do things the easy way because all that matters is life in this world.” No longer do the Churchmen want Christ the King to rule over all peoples and Nations. No longer is Evangelization of the utmost importance. The very mission of the Church is undermined and attacked, especially by the current Vicar of Christ, who considers doctrine and proselytism to be useless and even nonsense. Nowhere does the Pope talk about the salvific role of the Catholic Church. Why are we even Catholic if there is nothing special about the Church, if the Church is just a NGO that the Pope hypocritically condemns yet advocates for when he speaks about people’s happiness in this world, even going so far as to write a Papal Encyclical on the Earth and the Environment? Truly, the Pope is a product of the Counciliar Revolution. The whole of the Counciliar Revolution is embodied in the man. Books could be written about the errors that this Pope has advocated publicly to the scandal of the Faithful and the detriment of souls. One shudders to wonder what his Successor will be like. This is plain Protestantism. The Church does not have the power to change or alter the truth divinely revealed for our salvation. Our practices are based on our beliefs. If we throw out our beliefs, the religion comes crashing down, the Catholic Church simply would not exist. 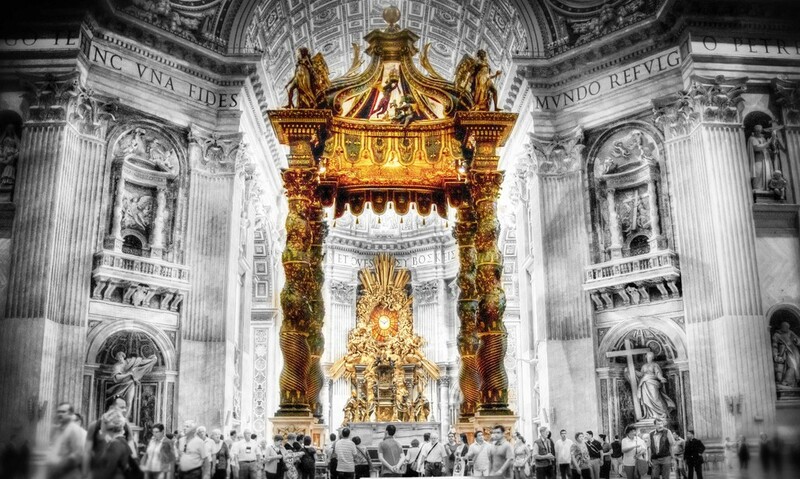 Fortunately, we have the promise of Our Lord that the gates of hell will not prevail against the Church. He never said they wouldn’t come close to it, though. Thankfully, we know the Pope has no power to change doctrine, no matter what he says. Someone should place before the Pope the doctrines and dogmas of the Church and ask him if he believes them. This is the man who is supposed to guard and protect the deposit of faith, not undermine and attack it. As I’ve said before, even the immoral, thieving, corrupt Popes of the Middle Ages did not attack the Faith, the doctrines, the traditions, her very soul. From all appearances, the Pope, sad to say, wants an easy religion where everyone gets along, nobody’s feelings are hurt by the hard truth and everyone takes care of the environment rather than their immortal souls. No longer can this be denied. Facts are clear as day. The Pope would rather work towards a naturalist utopia, whose foundations would be the uniting of all religions in a false unity, thereby undermining the teaching that there is no salvation outside the Catholic Church. The Faith is an intellectual assent to revealed truth, not a sentimental assent to one’s personal feelings and whims. These matters are serious, thereby placing souls in jeopardy who are ignorantly led astray by this lying novelty. What must be do in the face of this adversity? Make our voices known and fight for our Faith until, please God, he shows us what we must do. Sitting on the fence is simply not an option. You must do whatever part you can to defend the honor of Our Lord’s Church against those who would attack Her very mission. To refuse to do so is to abandon Our Lord’s Church at Her Passion, just as all but a few abandoned Our Lord at the foot of the cross. The Church will only be restored through the Counter Revolution, the Traditional Catholic Movement, the only Catholics that are keeping the Faith of our Forefathers, in the face of abuse and persecution from the Counciliar Church. I believe that the restoration of the Church and Christendom will occur at the Triumph of the Immaculate Heart of Mary which will usher in the promised era of peace. But, we can’t stand around, do nothing and wait. We are the Church Militant. Our duty is to fight by virtue of our Confirmation, where we became Soldiers of Jesus Christ. 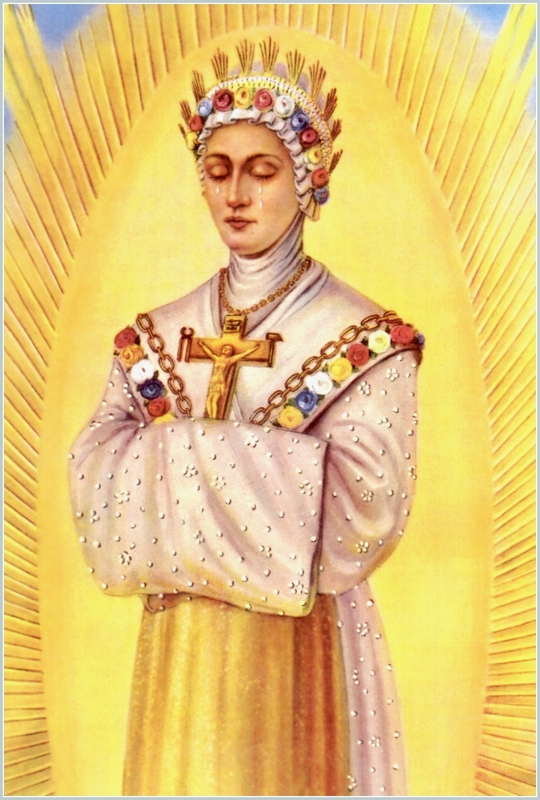 Our Lady of LaSalette spoke to us all in these words. May the restoration come soon for the sake of the elect. Fight worthily or die trying. 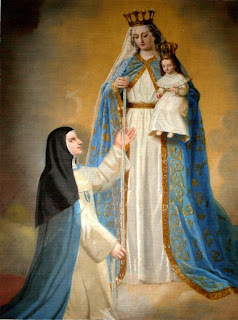 We will be victorious because we have the Mother of God at our side, the Saints of history trumpeting us on and the unchangeable Mass as our fortress, our consolation and our hope. Our Lord never changes and neither does His Bride, the Church, bulwark of the truth. This entry was posted in Apostasy, Church crisis, Modernism and tagged apostasy, Crisis in the Church on July 7, 2015 by damselofthefaith.